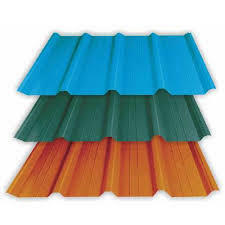 Prominent & Leading Manufacturer from New Delhi, we offer galvalume color coated sheets and pre painted galvalume sheet. The sheets don’t crack on exposure to sun and weather. computer-controlled oven. The result is a product which is highly resistant to corrosion, weathering and has excellent workability, durability and aesthetics.Products undergo stringent quality control tests to ensure performance in all-weather conditions. ratio) and Silicon (1.5% in weight ratio). The Galvalume steel coating combines the barrier corrosion protection of Aluminium with the sacrificial protection of Zinc, giving the advantages of both the metals. Galvalume in bare as well as pre painted condition finds wide application where high temperature resistance, heat reflectivity, flexibility, formidability and corrosion resistance are required. v Manufactured with a high precision pre painting process and adhering to stringent measures. 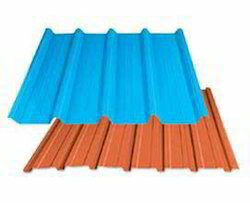 Looking for Galvalume Coated Sheets ?